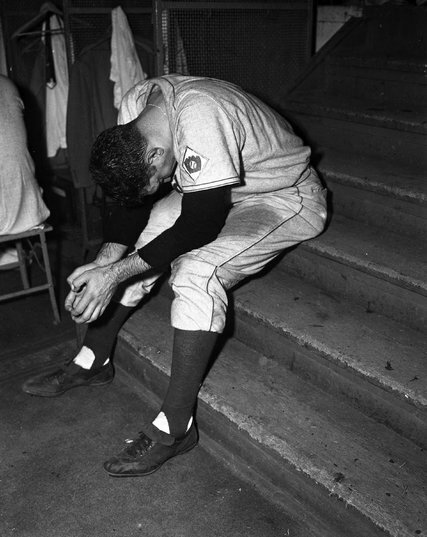 Ralph Branca of the Brooklyn Dodgers in 1951 after giving up a home run to Bobby Thomson that sent the New York Giants to the World Series. In 1902, a seamstress named Katherine Berger married a trolley-car conductor named John Branca and spent half of the next 26 years pregnant, giving birth 17 times. One of her children, Ralph Theodore, grew taller than the others. And he was a teenager, the only Branca to reach 6 feet, when he began to wonder why he alone had been so physically blessed. Branca had long since found his answer when, on Oct. 3, 1951, he looked to his catcher for the sign. Branca was now 6 feet 3 inches tall and weighed 220 pounds, a big big-leaguer able to throw a baseball over 90 miles an hour. And as he threw the fastball that was called for at 3:58 p.m., the Brooklyn Dodger had long since decided that he had been made big and strong so as to shoulder responsibility for his family. But then the New York Giants batter, Bobby Thomson, swung. And all at once, Branca, then 25, was left not only as baseball’s most famous loser but in want of another answer to that same desperate question: Why me? To hear Branca tell it, he did not let the unremitting aftershocks of the Thomson home run — the famed Shot Heard Round the World — unsettle him, not on the major league fields where he pitched five more years, nor off them, where he lived another 65 until dying on Wednesday at age 90. 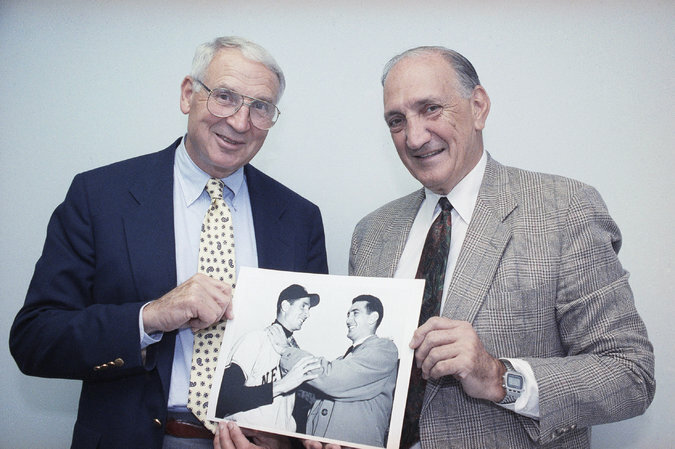 Branca and Thomson, left, in 1991 with a picture of themselves taken 40 years earlier, before a World Series game. Rather, he said, it took him mere hours to find his footing. For after a cold and tearful shower, he had posed his question to a Jesuit priest in the parking lot at the Polo Grounds and received an answer that made sense to him. God had chosen him to endure what was already a blow of biblical proportion, the priest said, because his faith was strong enough to bear it. And it was strong enough. Branca had found faith as a boy in the Roman Catholic church in Mount Vernon, N.Y., where his mother, Kati, had sent her brood to pray. And in the days and months that followed the Thomson home run, Branca kept that faith as he endured public discourtesy. Branca would be O.K. He had God and baseball and, 17 days after the home run, a wife, a green-eyed beauty in white satin named Ann Mulvey, who had already taken him for better and for worse. Yes, he had failed afield. But he was at peace. And so, suddenly, Branca no longer saw himself as a man who had failed but as a man who had been wronged. 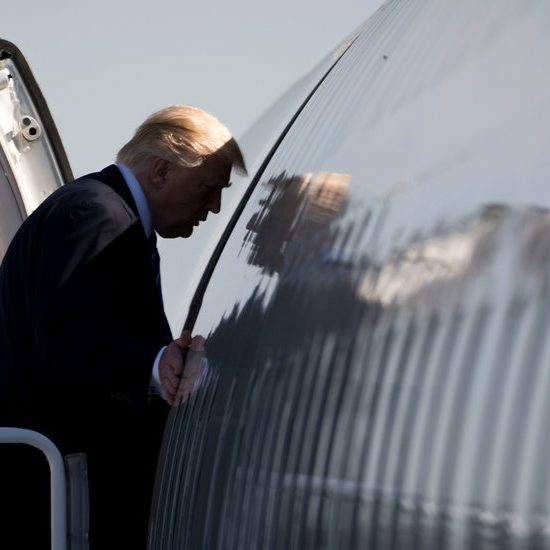 He grew bitter. And even after he retired, pitching insurance instead of baseballs, his question — Why me? — rang in his ears. 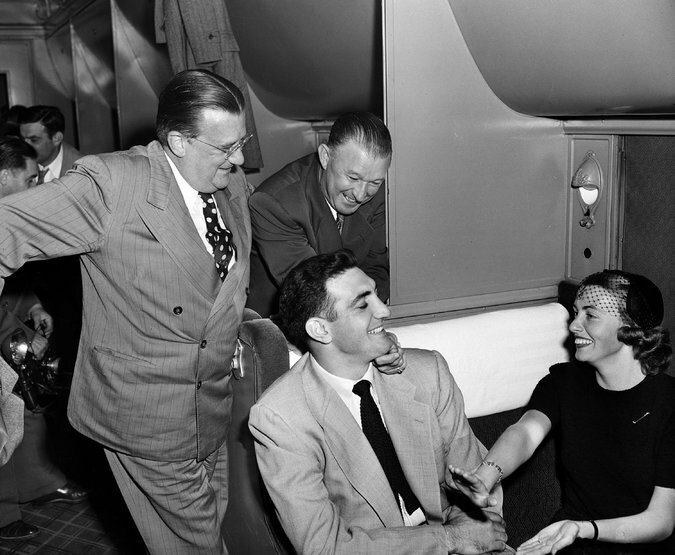 Branca and Ann Mulvey, his fiancée, in 1951 with the Brooklyn Dodgers’ owner, Walter O’Malley, left, and manager, Charlie Dressen. Few listened, however. And as the years passed, Branca began to appear beside Thomson nonetheless, the old pitcher heartened by religion, by St. Joseph, whom he selected as a boy to be his patron saint, and by St. Christopher, whose likeness he had been wearing around his neck when he gave up the home run. As for the home run, it continued to soar — written about by everyone from Steinbeck to Kerouac to DeLillo, christened by The Sporting News as baseball’s greatest moment, honored on a stamp. Branca thirsted for reassessment. And so, when in 2001, I laid bare in The Wall Street Journal the sign-stealing scheme the Giants employed straight through the home run that divided Branca’s life as surely as a line of chalk parts fair from foul on the diamond, Branca was thankful. “You loosened my lips,” he told me over and again. Those lips spoke increasingly of those achievements that the Shot Heard Round the World had drowned out, had taken from public memory. 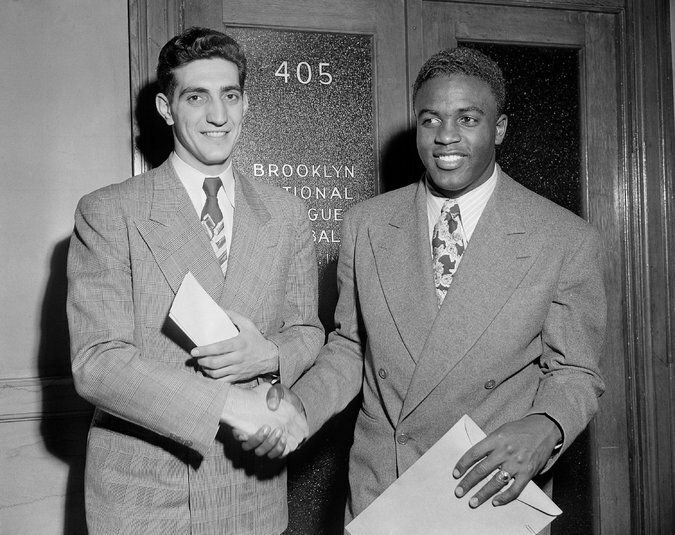 Branca with Jackie Robinson in 1948. And there were many. It was Branca who willfully stood beside Jackie Robinson on opening day in 1947 as his teammate readied to break baseball’s color barrier. It was Branca who won 21 games that season, completing 15 of them. And it was Branca who, over the six decades that followed his career afield, was by most every measure off it a wonderful colleague and friend and son and brother and father and husband. Still, Branca continued to wonder of the why of it all. And he was 85 when he put forth another guess as to why he had grown tall and become a pitcher and given up baseball’s most famous home run and been cheated, too. I had just told Branca what I had learned of his mother — that she had been born Jewish, and so, according to Jewish law, that he was Jewish, too. And home in Westchester, the old pitcher allowed himself a moment to see the home run, the great hinge of his life, as not a blessing but something else. 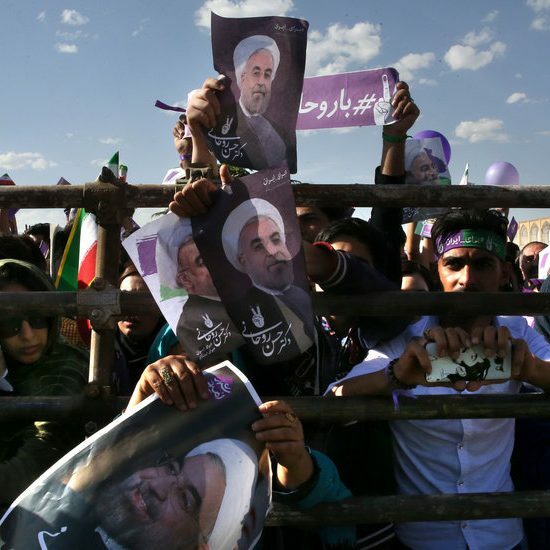 Iraq Told Civilians to Stay in Mosul. Now They’re Paying With Their Lives.